XS (S, M, L, XL, XXL) with finished chest width 100 (110, 120, 130, 140, 150) cm / 39¼ (43¼, 47¼, 51¼, 55, 59)"
There will be kits at naturesluxury.com from tomorrow. Today you may add the yarn into your basket and let Danica know, you’d like to get the pattern for free during the check out. 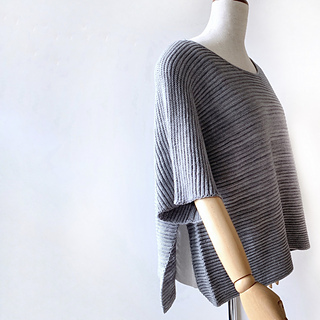 Horizon Line is a hybrid between a pullover and a poncho – a Pulloncho. 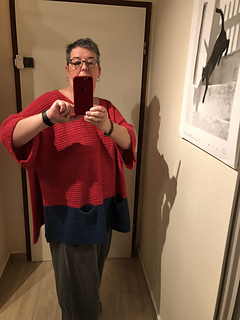 It has sleeves like a pullover and open side seams like a poncho. The open sides feature a pleat to keep a little mystery about what are you wearing underneath. Horizon Line is worked from the lower back over the shoulders down to the lower front. The sleeve seam is going to be closed as you go, so no sewing is required. This piece is your perfect layering partner. The oversized t-shaped structure is ideal to wear over a long top, blouse or dress. 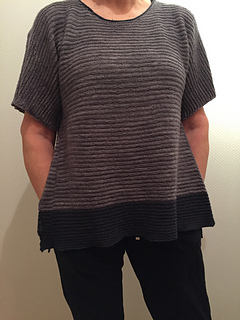 A generous scoop neck let’s your other layers shine through at the top as well as the bottom. 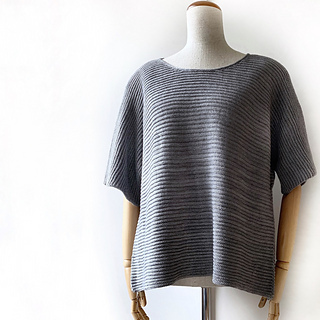 The uncomplicated stitch pattern and simple shape make it a timeless piece to be worn for many seasons. This sweater is designed to be worn with 18–28 cm / 7–11” positive ease around chest. 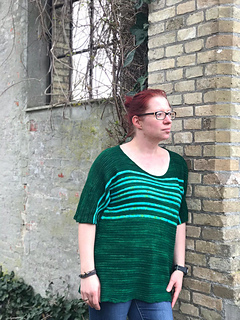 Sample is shown in size M with a 29-st gauge in colourway Le Métro, on a dress form with a 102 cm / 40” bust, with 18 cm / 7” positive ease. Take time to check gauge, and adjust needle size if necessary to obtain gauge. The stitch pattern puckers in height while being knit, but this will relax with washing as well as when worn. Three-Needle BO, BO in pattern, I-cord BO. Pattern has been test knitted and tech edited. Thanks to Danica for your trust and collaboration.